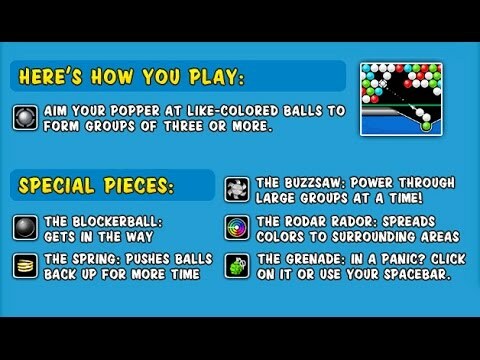 Shoot and bounce balls to create matches and avoid getting crushed. "Super Pop and Drop is very fun and challenging. I really like the new weapon, The Buzz Saw. I also like that they add another color to the later levels of the game. I was excited to see that this game was added to the list of discount games on GameFools.com. Super Pop and Drop has been one of my favorite birthday presents this year." Warning - Buzzsaws, Grenades, Springs, Blockerballs and Rodar Radors may be more fun than you can stand. Use these power pieces to your advantage as you avoid getting crushed by the balls dropping from above. You'll have your hands full shooting and bouncing balls in this high-action arcade game. Safety goggles are recommended.